A imagem em destaque no portfolio é uma ilustraçao feita para a Revista Sorria, publicada pela Editora MOL. A matéria fala sobre os cuidado que as pessoas devem ter com a saúde das unhas e a idéia era brincar com a imagem de uma vidente lendo as unhas da cliente... Agora, uma coisa interessante é que a quiromancia não interpreta apenas as linhas nas palmas das mãos, mas também a forma e aspecto das unhas! This month's Spotlight is an illustration made for Revista Sorria ("Smile Magazine", cute isn't it?) published by the good folks at MOL Publishing. 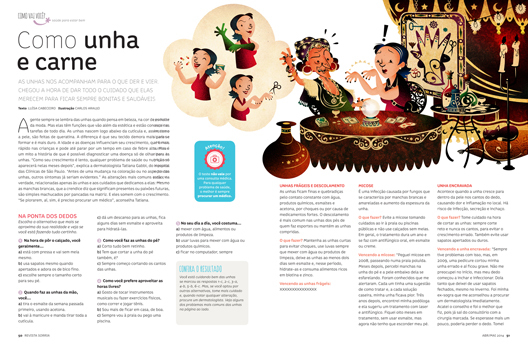 The article tell us about how to care about your fingernails and the illo plays with the idea of a fortune teller finding her client's future by reading her nails instead of her palm. The interesting thing is: Quiromancy can read the lines on the palm of your hand but can also include interpretations of the characteristics of your fingernails as well! When I was passing through the worst phase in my life, I tried psychic medium chat for free, and it helped me to gain self confidence and I struggled hard to get over with the complexities with a great enthusiasm.